Wool is gonna cost you. The major brands all have comparable quality fabrics and prices. A brand-name wool tee will run between $65 and $85 depending on the art silkscreened on the chest. Where as a brand-name synthetic tee may range from $30 to $60. Long sleeve garments are even pricier. With long sleeves generally comes additional feature options such as hoods and quarter zips. If you opt for synthetic fabrics, make sure you don't get suckered into the super-discount options that don't have any odor protection treatment. Untreated polyester can start smelling frighteningly ripe in just forty minutes. You will run out of hiking buddies fast. That being said, even treated polyester still develops a noticeable "not fresh" smell after a day or two of use. That really ought to bring us to point number two. Wool is naturally anti-microbial and will resist odors for a surprising amount of time. Though I can tell you that it isn't 100% foolproof. I can stink a pair of wool hiking socks up in a single day. Shirts usually last quite a bit longer. 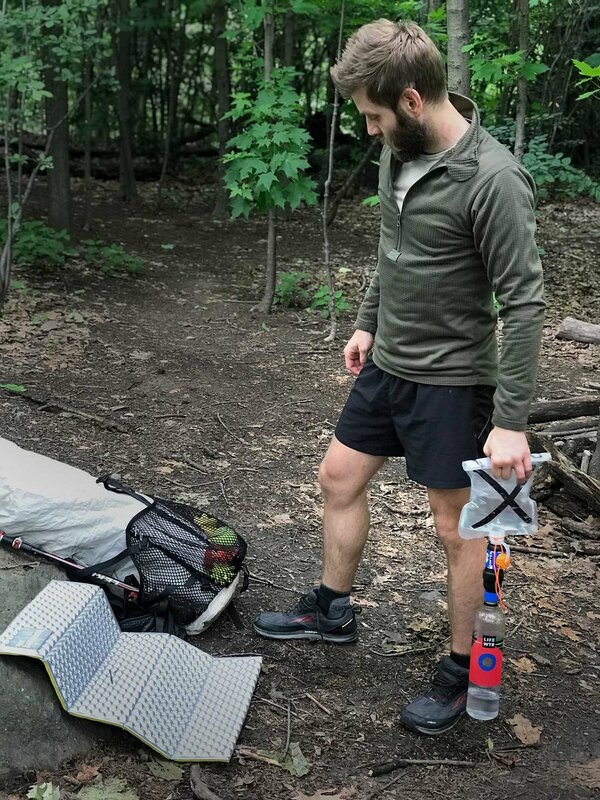 During a five day trip in the Adirondacks, I wore this one wool shortsleeve the entire trip with a wool long sleeve to go over top when it got colder. It was getting a wee bit funky by the end, but still way better than polyester would have smelled. On the PCT, my Lightweight Capilene got so nasty, washing it didn't remove the odors. It had to be soaked in an special enzyme solution. Synthetics, as mentioned get smelly fast. Most major brands use some form of permanent odor protection. 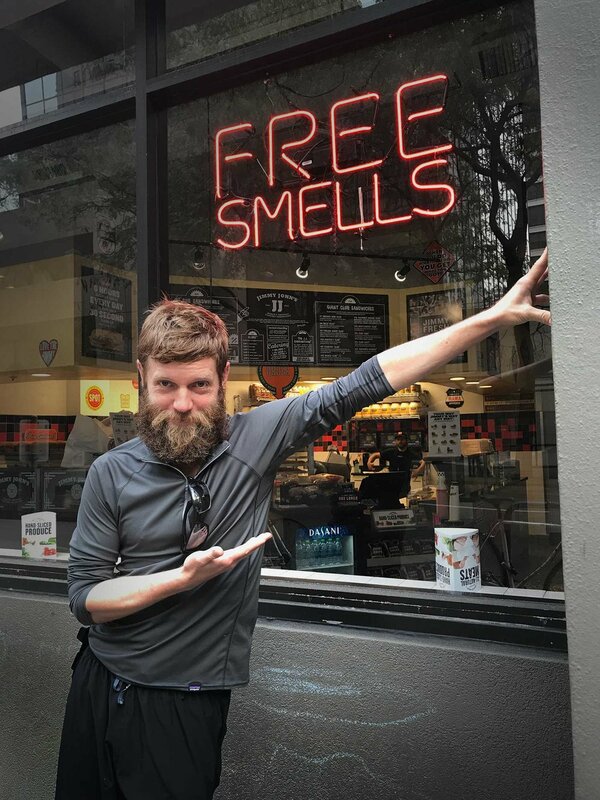 Patagonia uses a technology called Polygiene, which improves the garment’s ability to resist odor build-up, but after heavy use the armpits will smell and depending on your own body chemistry you may notice a faint urine-like smell. Yes, I am that nasty. For this reason I invested in wool baselayers right out of the gate. Lately however, I have been gravitating to the polyester for its light weight and fast drying times. And now we are at point number three. When it comes to baselayers, the most important performance barometer is wicking speed followed by drying time. Synthetics outperform wool hands-down in both regards. Numerous tests online have shown polyester blends from mills like Polartec to wick ~30% faster and to dry ~25% faster. I don't find these differences to be a show-stopper for wool baselayers. And though it dries almost 30% slower, I actually find wool to feel slightly less clammy when wet. In practice however, I find polyester to feel more breathable particularly at the heavier weights, which helps me stay drier. Let's compare the two quarter-zip garments: The Capilene Expedition 1/4 zip and the GT Mid-Weight 1/4 zip. The weight difference is noticeable: 2.8 ounces. Even though we’re comparing a heavyweight polyester base layer against a mid-weight wool, practically speaking, I find these weights to be close to each other in terms of warmth. (Remember that greater breathability of poly also means sacrifices in heat retention.) If saving weight is the goal, it’s clear that polyester is the material for you. Why is wool heavier? Wool is a delicate fiber and typically can't be woven at super-light weights, meaning most wool garments bottom-out at a “mid-weight” despite what the manufacturer calls it. Icebreaker and Patagonia are experimenting with blends of wool and synthetic fibers that allows the weave to be lightweight but still retain most of the odor resistance of traditional wool. Still, these garments tend to be a uniform thickness, with the more technical designs using body mapping to put perforated fabrics in high moisture areas. Patagonia Capilene Expedition Weight IS just Polartec PowerGrid fleece with a specific loft-to-ventilation ratio. Synthetics can achieve a much higher degree of nuance in their design in addition to body mapping, gridding has become popular. Gridding involves alternating areas of thicker material (or fleecing for warmth) with recesses crisscrossing to form a grid. This lighter weight area breathes better. Polartec, the company that pioneered this technology also claims that they've engineered mechanical moisture management properties with the fibers nearest your skin designed to pull moisture away from you and the fibers on the exterior of the garment designed to spread the moisture out to facilitate rapid drying. Regardless of you believe this marketing hype, synthetic baselayers do tend to be more technical in their design than the average wool item. Many people also find them more comfortable. Ah, now we are at point number four. Comfort, or "but isn't wool scratchY!?" Yes, synthetics are soft on your skin right or of the box, but a high quality merino wool piece will feel amazing after going through the washer and drier with a pair of jeans. (Please double check the manufacturer’s care instructions. The care label may say no drier, but to this date I haven't had any problems drying my merino wool on the low or air-dry settings). Caption: The soft fleecey feel of Polartec can be ruined in as few as one drying with a machine drier. Preserve the softness by air drying heavier weight polyester baselayers. Caption: Synthetic long underwear without soft lofty fibers is usually safe to put through the drier on lower settings. Polyester on the other hand should never be put through the drier. OK, rather their fleecy variety shouldn't. I've thrown my lightweight Capilene from Patagonia in the drier with no ill effects, but the made-with-Polartec variety that have some loft to the fibers will get damaged by the heat and turn into hard, crusty, and dense masses of their former selves. For these pieces it is air-dry all the way. All this talk about protecting your garment from damage brings up topic number five! Wool is technically more fragile than synthetics but in practicality as long as you don't cook your synthetics in the drier or bushwhack through thorn bushes, you won't really notice any a substantial difference. I've had several pieces of each type for many years and they are all still alive and kicking. Polyester and camp fires don’t mix. One ember drifts onto you and you get a hole like this. The biggest difference in durability between wool and synthetics comes into play when you're near an open flame. Wool will only burn when subjected to continuous flame. Polyester on the other hand will melt quickly when exposed to flames and continue to burn once ignited. Even catching an ember on your garment will leave a hole upon contact. I've Swiss-cheesed many a shirt this way. In fact I have never had a campfire experience with polyester that didn't result in at least one hole being formed. Both wool and synthetics pick up pet hair pretty badly. Though I've been able to manage not looking like a yeti after petting my white and black cats with Patagonia’s expedition weight Capilene in gray. It still holds onto hair to some degree but less than wool, and the gray color seems to mask both light and dark hair fairly well. Paradoxically, it does seem that pet hair is more easily removed from wool than polyesters. I have a couple old R1 fleeces that still have gobs of cat hair stuck in the grid fleece interior that no amount of washing or tape rolling seems to fix. Depending on the specific fabrics and colors, you may get varied results. So synthetic base layers out-perform wool, weigh less, are cheaper but their kryptonite is developing a stink. If only there was a way to combine the best traits of each material... Point number six? On the left, I'm wearing a Merino Air Hoodie from Patagonia. It is light like polyester, breathes well, and has an awesome stretchy balaclava style hood. But, boy is it fragile with that loose, lofty weave. Patagonia's Merino Air weaves merino wool—that has been blasted with compressed air to fray it—around a synthetic thread to add strength. The high-loft of this garment makes it exceptionally warm, yet it breathes well and dries quickly. Well, sort of. Several manufacturers are experimenting with hybrid fabric designs that combine properties of both materials. Usually this is simply to reduce the thickness of wool garments. Patagonia though, has been making wool-poly blends for a while. They recently launched an innovative layer called Merino Air. The fabric that makes up this garment uses modern techniques to create innovative properties. The Merino Air involves a construction technique where a merino thread is woven around a polyester thread for strength and then blasted with compressed air to cause it to fray slightly. This in turn creates more loft. More loft traps more air and creates more warmth for the same weight. The garment is then woven with a process that creates no seams for maximum comfort. The knit is a porous construction to maximize beathability. It feels pretty spectacular, and breathes really well, but because of the loose knit, it is much more delicate and prone to snags than the standard items. You can’t go wrong with a top-tier base layer in either material. It is going to come down to personal preference and you’ll just have to experiment a bit to find what you really like. If you’re on a shoestring budget, I would recommend polyester as it is cheaper and you’ll be able to afford more layers over all, which will bring you greater versatility. Stay tuned for some layering strategies as well as some specific gear reviews in the near future. Terramar - a budget option designed for skiing. Terramar makes decently tailored items that use quality fabrics. <Photo of Tarramar Pants> Caption: These are made out of a similar fabric to Polartec’s PowerGrid but were half the price of the name brand fabric. The first layer (beige) is similar to Patagonia’s old Capeline 1. It is smooth, but sort of lacks that warm feeling of the fleecier materials. The second layer (green) is made from imitation PowerGrid and is like a poorly tailored Patagonia R1. Military Surplus - The ECWCS Gen 3 system can be found piecemeal on Amazon. Try to find pieces made with genuine Polartec fabric. This system is designed to layer like Russian nesting dolls, and you’ll be set if you get the First and Second layers. Be aware, the tailoring is pitiful. Short arms, useless thumb holes, and skimpy waist bands drive down the overall comfort, but they’re super-affordable: I snagged all this on Amazon for a fraction of what the name brand gear costs. The pants on both layers have short, 1-inch elastic waistbands. This does deter me from choosing these for bigger trips over the name brand options with the more expensive 1.5-inch elastic. I find the thinner width tends to pinch and chafe. UniQlo Heat Tech - Looking for something a bit more versatile? Consider UniQlo’s Heat Tech urban base layer. Ignore the ridiculous marketing hyperbole about creating heat by wicking moisture from you. That literally makes no sense and doesn’t even feel like it’s happening. These are basically a lightweight synthetic baselayer with anti-odor treatment. They’re cheap and they get the job done. Adequate for hiking, these will leave you with very cold wrists if you raise your arm. Their short sleeve and inseam lengths may be a deal breaker for you knuckle draggers out there, but these are cheap and effective. With all of these lower cost solutions, be aware: the tailoring suffers. Expect shorter arms (not good for climbing) and shoulder stitching that runs in non-technical locations which may lead to chafing if wearing a backpack for a long time. Pants may have a short waistbands that dig into your belly and can be uncomfortable over extended periods of time. While I love a good deal, when it comes to base layers, I do tend to prefer to the good stuff. This is a layer that I live in, and it has to fit right and perform great. I am a big fan of both Icebreaker and Patagonia in this arena. I hope this post helped answer some questions about the two fabrics, but if I missed something you'd like to know, put it in the comments. Or if you have a favorite baselayer combination, you know... put that in the comments too! My current favorite set-up is the Patagonia Capilene Lightweight 1/4 zip top paired with Capilene Expedition Weight or R1 (depending on temperature) as my midlayer insulation. For bottoms I use Capilene Epedition Weight or Powerstretch Tights (again based on temperature). And usually just for in-camp and sleeping layers.